This picture belongs to a small group Toulouse-Lautrec painted outdoors in the garden of a friend during the summer of 1887. Writing to his mother that July, he complained, “The sky is unsettled and is sprinkling us with an unconcern that shows how little feeling the Eternal Father has with regard to outdoor painting.” An irreverent wit, Toulouse-Lautrec is best remembered for his lurid, acidic portrayals of the Parisian demimonde. Here we see a very different side of his production—tender and pensive—capturing the features of his favorite model, Carmen Gaudin. Her flaming hair and pale, sharp features appear again and again in his pictures from the late 1880s. This pensive woman is Lautrec’s favorite model, Carmen Gaudin. He preferred redheads. In fact, Carmen lost her appeal for him when she let her dyed-red hair grow out to its natural brown. Lautrec was a regular participant in the wild nightlife of Montmartre, the bohemian district of Paris. His biting lithographs caricature Montmartre’s cabaret performers and prostitutes, and like those works, this study also reveals his abiding interest in analyzing and interpreting unstated feelings. Carmen looks away, emotionally dissociated from us and from her surroundings. 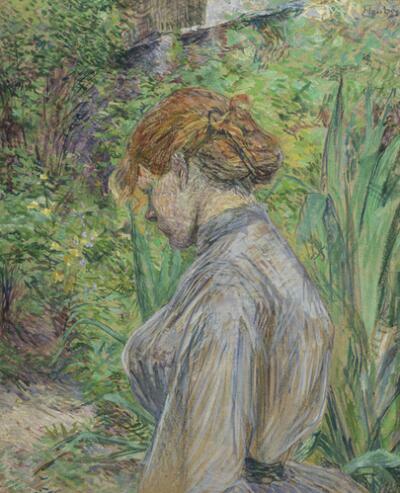 Perhaps she reflects Lautrec’s own hidden feelings of alienation and hostility. He inherited a condition that made his bones fracture easily, and left his legs permanently shortened. He was only four feet, eleven inches tall. Bitter about his physical deformity, Lautrec was plagued with alcoholism, a major contributor to his death in 1901, at the age of 36.